However, if you still want to regain your lost rights, you can try the steps mentioned below. The only requirement here is the presence of secondary or standard admin account on your system. 3. 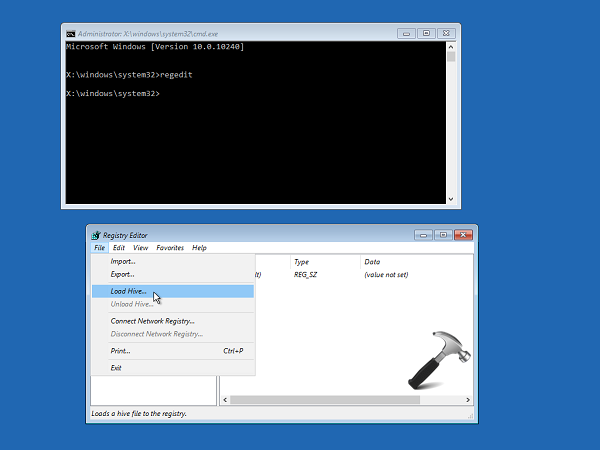 In the Command Prompt window, type regedit and hit Enter to open Registry Editor. Now highlight HKEY_LOCAL_MACHINE branch and then click File > Load Hive. 4. 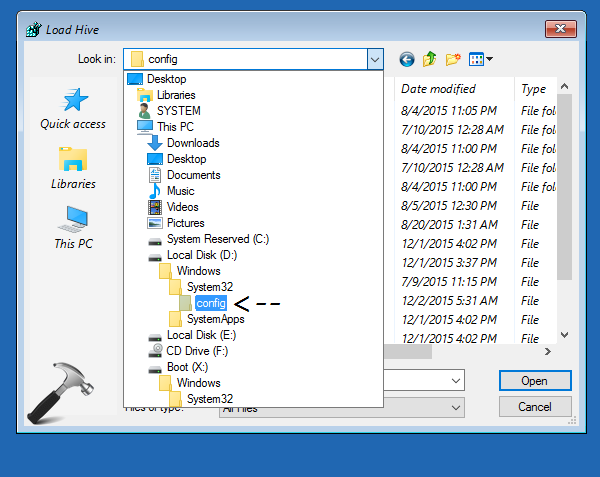 Moving on, in the Load Hive window, browse the folder system root drive > Windows > System32 > config. Go here, if you get “The process cannot access the file because it is being used by another process” error when loading hive. 5. Under config folder, type SAM or click file named SAM and hit Open/press Enter key. 6. Now provide a unique name to hive. In this case, you’ve to name it as REM_SAM. Click OK and hive will be loaded into HKEY_LOCAL_MACHINE branch. 9. 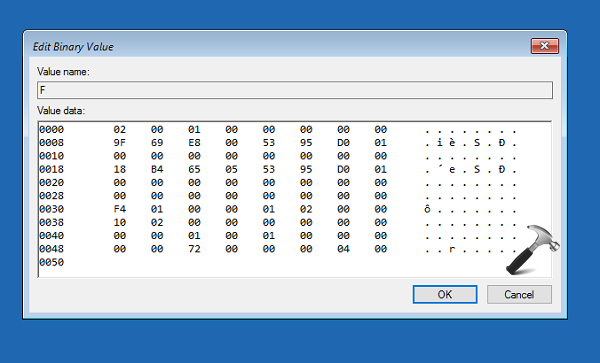 Finally, in the Edit Binary Value box shown above, place your cursor on line 38, in the right side of 11. Press Delete key now and then type 10. Click OK. Close Registry Editor and Command Prompt windows, and turn off your PC. After reboot, you’ll find that you’ve got your admin rights back. I reached step 5, then I stupidly managed to double-click the SAM file rather than click ‘Open’. Now when I try clicking ‘Open’, all I get is a message saying ‘This file is in use. Enter a new name or close the file that’s open in another program’. 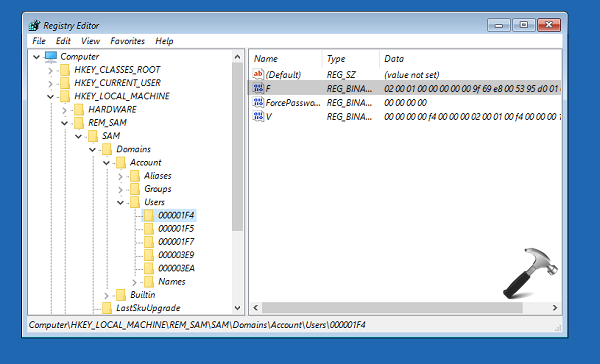 Also, there is a key in the Registry Editor called ‘SAM’, under HKEY_LOCAL_MACHINE, that contains only a single subkey, also called ‘SAM’, which contains only a ‘(Default)’ REG_SZ file. This key might have been there to begin with, but I suspect was created by my error. Is there a way to correct this error and create the REM_SAM hive I was supposed to, or have I just screwed myself completely? ^^ The ‘SAM’ key is there by default and it have user records. Can you retry complete steps carefully and as directed, see if it helps. Tried it again several times, and still coming up with the same error message. I’m loading the file from the local drive (C:, in my case) as instructed. ^^ I don’t think so. It just enables the administrator account and do not delete your files. Hi, I’m boriswil. You answered me, thanks, but I DON’T have a secondary admin account and my built-in adm acc was accid deleted. Is there a way to restore it or somehow recover admin rights without doing a reset to factory settings and horribly losing a lot of things? Besides, my windows 10 was installed in my laptop when I bought it and I don’t have a win 10 disk to do such reset to fact settings. Is there any hope? Hello Kapil Arya, I have a question hope your help. Question: If my size of the cursor file is greater than a certain value and is displayed to be compressed. 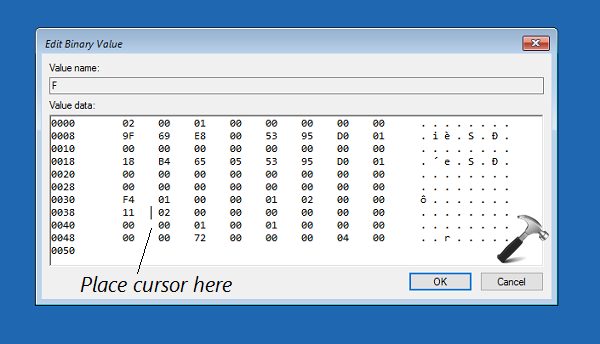 Using setsystemcursor() set the system mouse pointer is not working. Whether the question can be fixed by modifying regedit value? Kapil, what about enabling built-in Admin from CMD (from booted media if necessary) to change account back to Admin? Would this also work, or has something else happened to the account? OK I’m going to start recommending it for these instances. Do you happen to know what is happening to explain why an Admin account could lose privileges without the existence of another Admin which is supposedly forbidden? Is it a bug? If so we need to elevate this. I do notice that since CMD is always going to prompt for Admin permission except for booted media, that Shawn has a different approach for it specified in tenforums.com/tutorials/2969-enable-disable-elevated-administrator-account-windows-10-a.html. ^^ Not sure what may cause the issue of losing admin rights but most users have faced this. A close suspect might be third-party programs or Windows Update. I don’t think it’s a bug. Hello I get to the point where I need to load the C: drive but uuuh even in Hive it does not detect that I have ANY drive …. Therefore I cant continue..
^^ Can you load SAM file? of course I cannot install or uninstall anything. I cannot Run anything, no regedit, if I try to run config I get a message ”You dont have permission to access this folder” and if i click continue to get access nothing happens..
hey! this actually worked.but i am wondering if it will harm my pc. hi again. I want to ask that my windows does not respond frequently and other programs crash frequently.also uninstall.exe is gone. why is this happening.it started after i did what you said in this tutorial. As of 3/23/2018, this solution is still working. Thank you, Kapil Arya! That said, the “Delete” part in step 9 should be “Backspace” instead. I don’t have permission to access the config folder. How do I get to pass this point? Thank you so much for this fix, it saved me hours of work and stress. thank you very much. you’re one of the best. When I got to step 8, the F 00038 value was already set to 10. What do I do? Everything worked fine except this created an “log in” at the start screen that needs no password. Although I am the only one using my computer Im not comfortable leaving administrator rights open to anyone who decides to turn it on or if it gets stolen. ^^ Alright! You can add a password to this account, using lusrmgr snap-in. Open this snap-in, click Users > Built-in administrator > right click > Add password. Hi Kapil, After getting into command prompt mode , its asking for Administrator password which i dont remember. Is there any way I can remove the password to fix this issue? Hi Kapil, when I got into Command prompt mode, it asked me to login to administrator mode for which I dont remember the password. Is there any way I can get into the next step by removing the admin password? Its not letting me go ahead with further steps to get back lost Admin access. ^^ Plug Windows 10 bootable USB and then use recovery mode Command Prompt. I think I’m in the right area… After a system reboot and reinstall of Windows 10, my PC no longer recognizes my password and says “Windows couldn’t connect to the ProfSvc service. Please contact your system Administrator”. I am the Admin. It’s my computer. 😡. Cann you help? Thanks, Kapil. But since my screen login doesn’t recognize my password, in locked out and unable to access the start menu or Internet. Thanks, Kapil, but I’m locked out and unable to access the start menu or Internet because of pc says password is not valid. Thank you so much, Now I can full control the computer again. Thanks a lot kapil…it works! ^^ Here, ‘system root drive’ means the drive on which Windows is installed. I can’t get to the command prompt or any other menu in the advanced options, it requires me to login as an admin and when I do it keeps telling me it’s a wrong password although it is not. Thanks Kapil you are really a genius . I have only ever had one account – ‘Colin’. I’m not aware of any others – although I think I added me as a gmail address account. 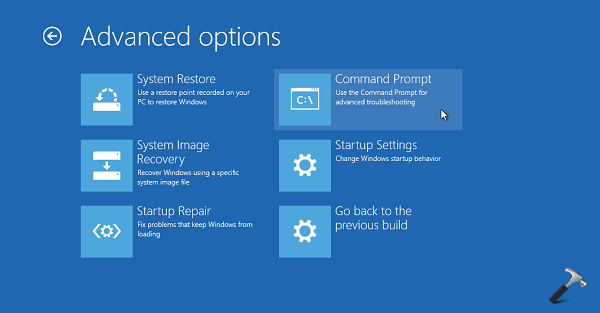 ^^ Try booting via Windows 10 install media, it won’t require secondary account to operate Command Prompt. What will i do if “Load Hive” is not clickable after it opens the registry editor from cmd? If I could access config, I wouldnt need to come this page. this is of no help. gets stuck at config with same prob. ^^ What is the exact error you received? I don’t know how to Thank you because just saying thank you is not enough..I followed your advise step by step and I could add restore my admin privileges. Thanks a million bro! God bless you. Prior to this last forced upgrade from Microsoft, I was able to stop and disable update service and update orchestrator. Now both services are greyed-out saying I don’t have permission. I am now only able to temporarily end the process of these services only using the PID in Task Manager. I am able to do some playing around with these two services in Task scheduler but I am now limited there also with no permissions. and everything went just as you said. However, it did not fix my greyed-out or permission issues. Specifically, in windows update and update orchestrator, I still do not have privileges in those services (still greyed out), and my Task Manager, and Task Scheduler, and Registry still prevent me from privileges. I did have all of those privileges prior to this last forced update about one week ago, 20 Dec 18. I know there are those working on a fix to prevent 1809 from downloading soon, but sure was hoping your fix would have done it. Thanks for your efforts. ^^ Try booting into Safe Mode, see if that works! ^^ I don’t get that: ‘just hit enter leave the box empty and it should work’. There is no box appearing which can be skipped with Enter key. Hello Kapil, I did the exact steps you provided here and when I typed the REM_SAM, I got ‘couldn’t load SAM file, it is already in use’. What should I do? Can you help me? I have two problems with your progress At first when I hit command prompt open blue page that asked me enter ID key I skipped this and then typed regedit and so on untill I must go to windows which that on C partition but my c partition were blocked by bitlocker but I opened system32 file on C with dos and after that go to config and select SAM.the 2nd problem is when I typed REM-SAM and hit enter give me an error message please let me know what can I do? Hello. I can’t use regedit on com prompt w/o admin right through Sys Rec Options. I signed in and tried again on com prompt. I got as far as Load HIve. No folder of system>root drive>windows>system32>config. Everything else I tried to open I need admin right. I went to delete 11 and type 10, 10 was already there. so this didn’t work.﻿ What to do? ^^ Please refer WAY 2 mentioned here: https://www.kapilarya.com/how-to-enable-built-in-administrator-account-in-windows-10.